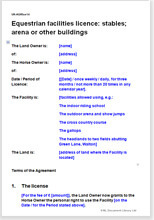 This document governs the use of any facilities, for example, show jumps, arena, gallop or cross country course. It has been drafted specifically to protect the owner from claims. Can be used once or as repeat terms.